gebioMized that’s ergonomic cycling products made in Germany. After years of intensive research in cooperation with Münster University a worldwide unique and patent-registered product has been developed – the customized gebioMized saddle. For the manufacture of such a saddle a dynamic measurement is carried through. For this purpose the cyclist’s own bike is positioned on a trainer and the whole seating position is analyzed and improved according to ergonomic parameters. In doing so several pressure measurements will be done using a high-tech pressure measurement film. These measurements show the problem areas on the saddle as well as the pressure values, measured in millibar, and indicate which bloodstreams, nerve tracts and osseous structures are strained. Using these data we construct and manufacture the individual saddle that fits the needs of the cyclist here in Münster. After the individual surface structure has been milled, the saddle is manually covered with premium real leather. This procedure resembles the construction method and the basic idea of insole supply for runners. Through the combination of technical analyses and quality handwork we build a unique product that perfectly matches your body. 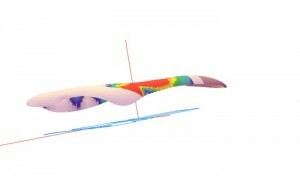 Through using this methods the maximum pressure values on the saddle can be reduced by up to 40% and asymmetries or malpositions can be remediated. You won’t only enjoy the improvement on your next ride; we will also show it to you through control measurements when delivering your saddle. 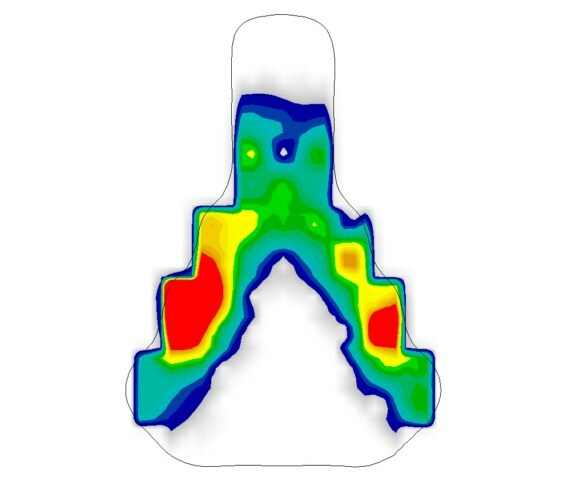 We have constructed several basic gebioMized saddles for different usages – to range from the comfortable everyday saddle Sherpa’ to the slender race-saddle ‘Cobra’. The ‘Anaconda’ – the snake among the gebioMized saddles: slender shape, long and wide saddle nose, plain form, whipping design and a precious robust real leather skin. Including the 85mm titanium rails, the Anaconda weights about 240g. Due to its long and wide saddle nose this model is well suited for the cyclists with problems in the area of the pubis. Through the particular design of its hard shell the saddle also cushions in the ischium area. The usage of this model ranges from road bike to a sportive traditional bike. The Mach1 has been developed in cooperation with pro-triathletes to fit the extreme demands of a triathlon. The result is a slender form combined with a broad saddle nose that offers enough room for the thighs in the transition section. This combination lives up to the demands of the extreme seating position and the high pressure on the saddle nose and is suited for male and female triathletes alike. When using titanium rails the Mach1 weights about 210g. Of course you have free choice concerning the hardness of the saddle’s foam as well as the colour of the real leather cover. The ‘Cobra’ is the top athlete within the gebioMized family – slender form, little weight and premium materials. This combination is primarily oriented towards the demands of race cyclists and race-oriented mountain bike riders. Those who have an eye on the weight of their bike make the right choice when choosing the lightweight Cobra with just 195g. For this model we use a tight foam material, titanium rails and a carbon enforced hard shell. Of course the individual saddle is leather-covered in the colour of your choice. The ‘Viper’ combines all of the ‘Cobra’s’ merits – only concerning the weight the ‘Cobra’ is a whisker ahead. Apart from the use of chromium rails, which add 40g to the total weight of 235g, the Viper is identical in construction. Also here a tight foam material and a carbon enforced hard shell are used. The foam’s hardness can be customized, which is true for all of our models. This model holds what its name promises: customize, sit down, ride and relax. This model already experienced some extreme rides! Lately, it travelled the 17,500km from Münster to Wladiwostok, spent countless days in Africa’s dusty deserts or accepted the challenge of the Race across America, which meant 4,862km nonstop from West- to East Coast. All of these experiences hint towards the comfort that this customized model offers to its riders. The foam cushioning is comfortable but not too soft and lays the foundation for long distance rides, mountain bike tours or trekking adventures throughout the world. What sets the ‘Sherpa’ apart from our other models is its broad seat – 16cm – and the foam’s comfortable hardness. Moreover, with its about 300g the ‘Sherpa’ is a lightweight among the comfort saddles. It is ideally suited for those that ride for pleasure and enjoyment. Thanks to its elastic hard shell, the saddle flexes when cycling and the bony structures of the ischium are relieved.